We barley had time to celebrate the fourth over here in Zambia but don't worry we did! 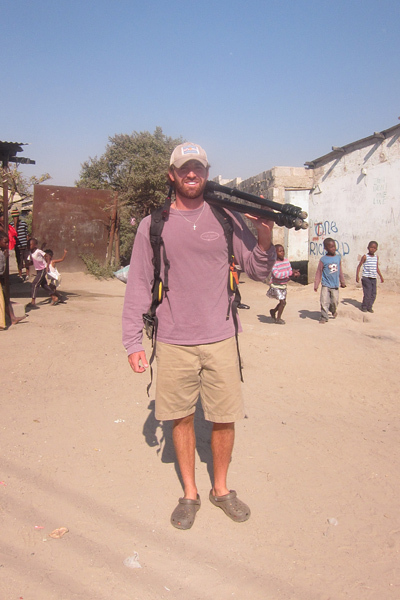 I have been in Zambia for about three weeks now and hit the ground running. Camille, our Arise Africa intern has been with me the entire time and has been more than a lifesaver. As you have seen she is updating the blog and doing many many more tasks. She has jumped into the madness of Africa quite well. I have loved watching her Type A personality who is incredibly organized and has everything planned out adapt to the craziness of our lives over here. She is coping with the chaos and lack of structure in a third world country. The first few days she asked questions like, "why do they just put road humps anywhere they want?" or "so the traffic lights never work?! Why do they have them?." I put Camille on the task of handling the guy who makes our Americans their gifts and it is quite extensive. It requires him knowing names of Americans and he carves these wooden plaques for them. I literally laugh out loud as Camille talks to Tom on the phone. I can hear her saying things like, "Tom tell me the TRUTH how many do you really have done?" or "Tom there is no way you have that many done last week you only did five!" or the best was "Tom I am not giving you more money for supplies you are fine and deal with it!" Another great Camille moment was when she was planning her trip to Victoria Falls. Steve Vanderheide, an incredible videographer from the USA has been working with us this past week shooting tons of video and our friend William was here helping him. Camille, Steve, and William decided to head to Victoria Falls this weekend for a little break before the boys head back to the states on Monday. They decided to take the bus down to the falls which is an experience in itself. It is a 6 hour ride (if it goes well) and you get to see Zambia and the rural villages. We gave Camille the phone number to the bus station so she could call and figure out when the bus left. Camille called the bus station last weekend asking for the schedule for Friday the 5th of July. The guy quickly told her she can only call two days before to know the times of when busses left or if there was even going to be a bus. I heard Camille go, "TWO DAYS before?! How do I plan? I already have hotel reservations! You don't know until the day before if a bus is even going or when it leaves?!" I was laughing hysterically as I listened to Camille struggle to accept the fact that she will not be able to plan anything until two days before. Luckily the bus worked out and they are at the Falls right now. Let's hope there is a bus back tomorrow! Another skill that Camille has learned which I think will be very helpful on her resume in America is that she now has some experience patrolling monkeys. Greenhill School, where we had our kids Bible camp with American families has a "pet" monkey, Jacque, who is an absolute pain. This thing gets into everything you have. Try running a kids Bible camp with food, (they got bananas for snack everyday!) crayons, people's backpacks, flags, and all other items all over the place. Jacque would come flying from any tree around and swoop down and steal sandwiches out of kids hands and fly back up in the tree and taunt us with it shaking it around. 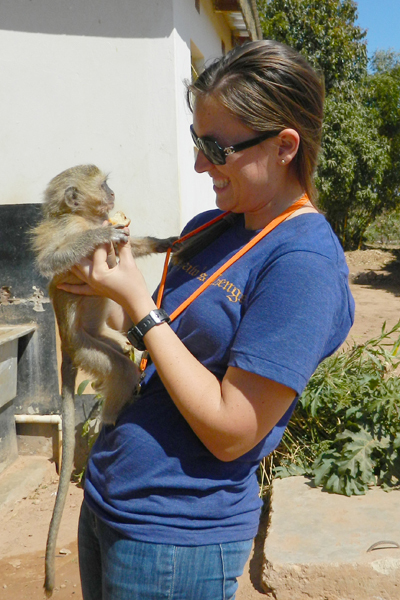 Camille was very good on monkey patrol and did her best to defend the poor kids and adults in our camp. Yea he looks all sweet and nice right?! This is Jacque biting Camille's hand off trying to escape, yep all week she dealt with this. I also realized that Camille has adapted to African life rather well when she was beyond excited when an American family left behind some Zip Loc bags for us. She was giddy with excitement as she explained to me that we would have a bag for everyday of camp next week to put our sandwiches in and she didn't have to keep using the same one and washing it out! It was like Christmas Day for Camille. As she explained this to me with a huge smile on her face I knew she had been in Africa long enough to enjoy the simple things in life, like a zip loc bag. Meanwhile I was thinking to myself, why was she washing the bag out everyday last week at camp? Just use it over and over again for the sandwiches! Camille has jumped into working with our staff and the kids in the Arise Home. She is so patient and calm when the kids want to read books with her. She let's them listen to music on her phone. She has helped them cook, and plays soccer outside with the boys. In fact I saw her do a victory dance when she scored a goal against Andrew, one of our best soccer players. She loves everyone so well and has been so caring. Megan and I would be a mess without her over here right now. She helps both of us out so so much! Steve and William have been so great to have around this past week after our American families left. They have been shooting video nonstop and doing interviews with our staff, Arise Home kids, and community school partners we work with. William is an expert at sound now. We are excited to see the video produced from this past week. The other day we went to Destiny School and had a meeting with the parents and guardians of the children in our child sponsorship program. They had been asking for a while to meet me, since they always see and know the headmasters of Destiny. They wanted to thank me for helping their kids so much. I must admit I feel a bit like a crook because I am the face they see, however it is the sponsors who pay for these kids, not me. I wish every child's sponsor could have been in this meeting, it was so touching and special to experience. One mother stood up and her child Faith is new to our program. Faith is HIV positive and started receiving her meal a day through us about two months ago. The mother began to talk and said to the entire room, "As you know my child has been very sick." Then she put her head in her hands and started to cry. It was really hard to see and I felt this mom's pain for her child. She went on to compose herself and explain that she is alone in this battle, the husband died a few years ago. She takes her daughter to the hospital and they struggle to have any food at home. To take your HIV medicine on an empty stomach is a very bad situation. She thanked Arise Africa for the meal that Faith eats everyday at school and how that is helping her fight her illness. Just a simple meal a day is what this mother was so thankful for. We had the mom stay after the meeting and we explained to her that we want to help them as much as possible and that she is not fighting alone now, we will be in the fight with her. I struggle sometimes with thinking we aren't doing enough. I was laying in bed that night asking God what else should we do. Please help us pray for Faith. The parents and guardians of our kids in the child sponsorship program also brought gifts for me. I must admit I was concerned, I have been forced to eat things that aren't so great before and my weak stomach isn't a very good sport about it. I went into this fully thinking I would be spending the rest of the day in the bathroom. I was pleasantly surprised at the crackers, coke, and cake that was passed around! The biggest gift I got was a VILLAGE chicken! Let me explain this to you, a village chicken is MUCH bigger, and it is a very special occasion to eat a village chicken. Let me also explain to you that the VILLAGE chicken was given to me alive. Brenda, myself, and Susan (Destiny Child Sponsorship officers) with the chicken. After our meeting we put the (live) chicken in our car and shot some video around Destiny School with Steve. We went to visit two of our kids homes that are in our child sponsorship program, Vainess and James Mapita. I didn't know off the top of my head who their sponsors were but quickly remembered when we walked in their home and they have every letter and photo their sponsors have ever sent taped to their walls. Steve and William have spent days in the compounds shooting video, they are an awesome team! Later that day I gave the village chicken to our Zambian housekeeper/mom, Susan. She was so excited she couldn't stand it. Susan lives in a house right behind our's. My instructions to her were that I didn't want to know what happened to the chicken, I didn't want to hear it dying, and I didn't want to be woken up to it crowing. She quickly said she would handle it and I never had to ask about it again. That plan worked well until a day later when the chocolate lab puppy came running in the house and threw up a stomach full of black chicken feathers. hmmm... I am choosing not to ask and pretend like it didn't happen. We celebrated the fourth of July very casually over here in Zambia. We were invited to the US Embassy for a celebration party. We had fun hanging out with embassy staff and the US Marines that guard the Embassy. I would show you photos but you aren't allowed to take photos of our Embassy! After the embassy party we had Zambian and American friends over to our house for some burgers, apple pie and other treats. It was fun to go around the table and her Americans from all over the USA talk about their family's fourth of July traditions. There is some weird stuff people do! I also realized not every state appreciates fireworks as much as Texans do. It was cool to hear the Zambian's take on things as well. We had tons of lefotver food that everyone got to take home. I accidentally pulled out the Zip Loc bags to send food home with folks and Camille quickly reminded me that we need to ration our plastic bags and not waste them on our guests! I am enjoying a weekend of quiet as we prepare for this next week. We have another full week of American college students from PCPC church coming in on Monday to run a kids Bible camp. We are excited and know the Lord will use their time here in a great way.